In the Deep South we don't steam our seafood. Whether it's crab, shrimp or crawfish, we boil it in highly seasoned water. Small, red-skinned potatoes, smoked sausage and chunks of corn are included at minimum. For my boil recipe, I also like to add smashed garlic, sliced lemon, quartered onions, and a few other ingredients you might not expect in a boil, for a little extra flavor boost. Some folks add in even more flavor extras, like chunks of celery ribs and even button mushrooms. 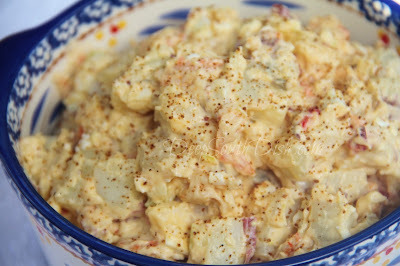 Don't worry though if you don't happen to have leftover potatoes and seafood from a boil, because you can still make this potato salad on purpose! Just check out my cook's notes at the bottom of the recipe. 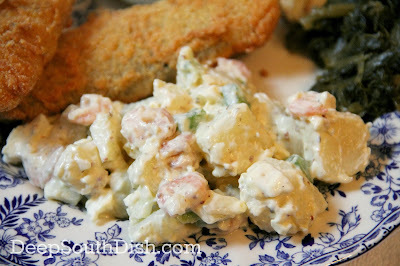 For more of my favorite potato salad recipes, visit my page on Pinterest! Heat leftover potatoes in the microwave just to warm through. Mix together the mayonnaise, mustard. Old Bay and Creole or Cajun seasoning. Add to potatoes while warm and toss Add onion, celery, eggs and seafood to potatoes and gently toss, adding additional mayonnaise as needed for desired creaminess. Taste and add salt and pepper, only as needed. Cover and refrigerate for several hours or overnight, to allow flavors to develop. Keep refrigerated. Just before serving, sprinkle the top very lightly with additional Cajun or Creole seasoning for garnish, if desired. Cook's Notes: No leftover seafood boil potatoes? Boil 3 pounds of red potatoes in water with 1 tablespoon salt and 2 tablespoons crab boil, until potatoes are just tender, about 15 minutes, depending on their size. Drain potatoes well and set aside until cool enough to handle, then dice. Add mayonnaise mixture while potatoes are still warm and proceed with recipe. Okay to substitute imitation crab. If you're using raw shrimp, season with salt, pepper and Cajun seasoning and saute in butter until no longer translucent. Let cool. I bet this recipe would be great with pasta instead of potatoes, too! It would! I actually have a seafood pasta recipe here, though the dressing is seasoned a tad differently. We recently had low county boil with shrimp and I worked at not having leftovers - I won't do that next time as the potato salad sounds outstanding. Hey Larry! Good to see you!! Living on the Gulf we tend to have seafood boils fairly regularly so leftovers are pretty common, but even if not, I try to pick some and set it aside on purpose for salads of some kind!